It is important to collect data as accurate as possible if the objective is to produce an accurate result. For the purpose of research, I have collected data regarding the cost, maintenance and operation of all types of home appliances from one of the biggest private residential camps in the world (it currently is the largest private residential camp in the Eastern Province of the Kingdom of Saudi Arabia). There were some missing values in the dataset which were automatically adjusted to equal $50. This is an assumption in the light of the general identification of $50 as maintenance cost in most appliances so that it has been assumed for each of the appliances. 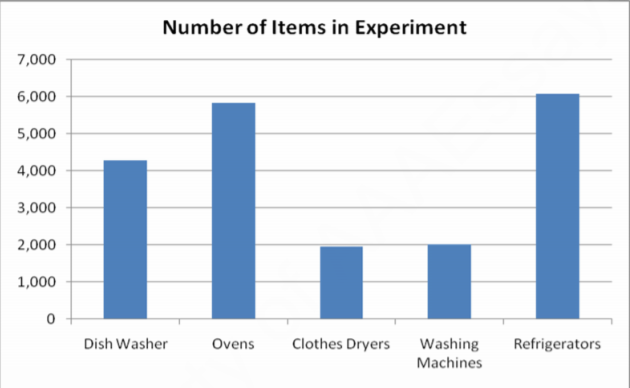 The above information can be displayed in the following graph: As is visible from the graph, the quantity of clothes dryers and washing machines used was approximately the same at the 2000 level signifying that a smaller population (of data) was available for research for these appliances. Ovens and refrigerators’ data, on the other hand, was derived form a far greater number of appliances making the results more accurate and closer to the actual values. The dishwashers used were also considerably higher than the clothes dryers but less than the number of ovens. One of the most daunting tasks in a thesis is to be able to use a suitable measurement technique to draw conclusions upon. There are several models available based on different assumptions and approaches. Major techniques include Present Value, Future Value, Average Value and so on and so forth. Valuation techniques depend on the situation, the scope and the nature of the data available. Thus choosing the most appropriate valuation technique is very important to make sound evaluations. For this purpose, I have decided to use the Present Worth technique in order to make assumptions and draw inferences during the course of this thesis. The Present Worth or Present Value (as is mostly referred to as in the corporate world) is an evaluation of the net worth of the asset (or the investment) in terms of today. The Present Worth method adjusts each cash transfer (whether its positive or negative) to a value that would be the same as enacting the transaction today at this very time (Ross, 2004). This means that each and every inflow or outflow (revenue or cost incurred) on an asset or investment should be converted to its equivalent value “today” by dividing by the relevant interest rate factor.The interest rate factor is often referred to as the discount rate and is in effect the adjusting factor by which the cash inflow and outflows are adjusted. Since countries generally experience inflation, the value of a future inflow or outflow will have reduced effects in today’s terms. This means that a future payment is worth less today and a future cost would cost less today – it has both sides to the coin.